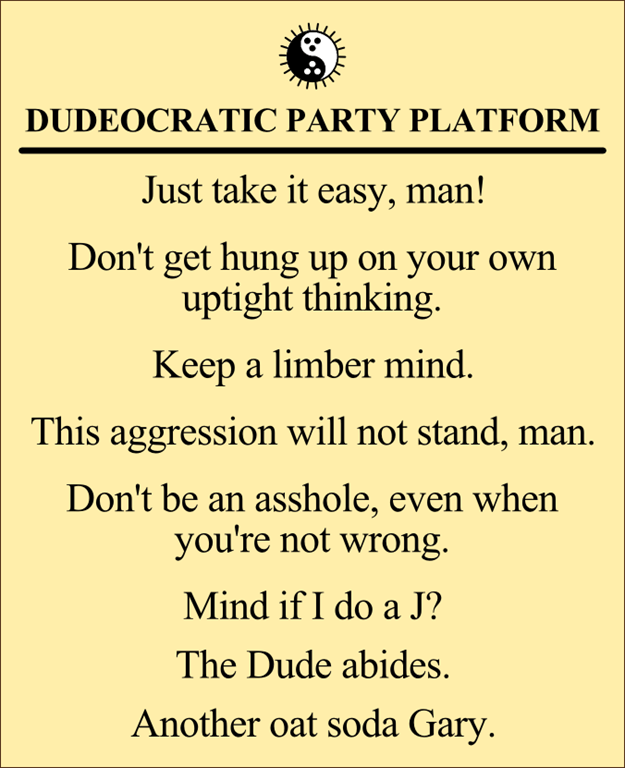 This November, no matter who you are planning to vote for, or not vote at all, the Dudeocratic Party would like to urge you to elect a more abiding state of mind. 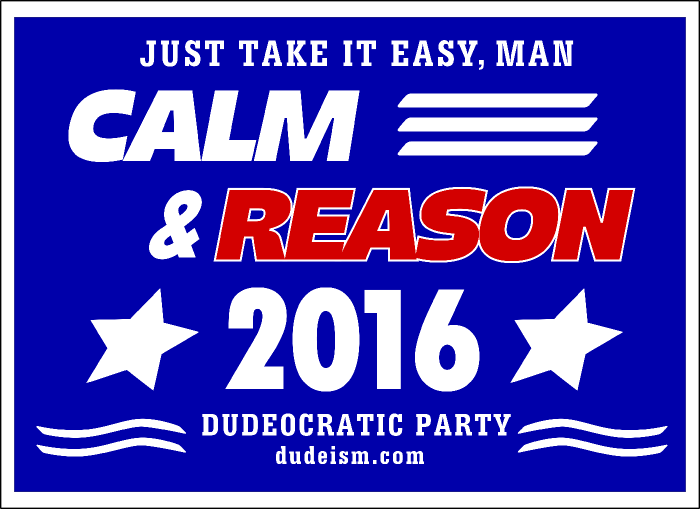 In this effort we nominate Calm and Reason as our candidates for state-of-mind this campaign season. Calm has a proven track record of de-escalating situations, while Reason has been at the center of human progress since the dawn civilization. Together they can lead us to a better future, to better politics, and to a more harmonious society. Calm and Reason are part of the abiding lifestyle, and the cornerstone of respectful debate and civilized conversation. 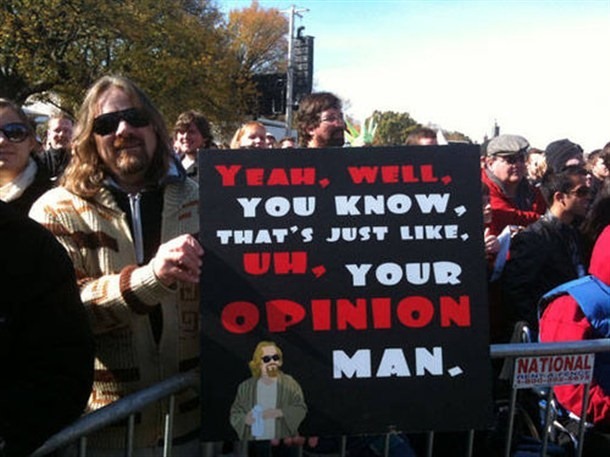 We of the Dudeocratic Party we don’t presume to tell you which human candidate to vote for, that is not our thing man. We are talking not about political states, but states-of-mind. Our involvement in politics only goes so far as to seek a better means and a more abiding spirit in which we can all engage politically. We are not campaigning for politicians, we are campaigning for rational and respectful discourse in our world. Our nomination of Calm and Reason as preferred states-of-mind is an effort to move our society toward a more abiding and prosperous future, a future civilization with decency and respect for each other as the cornerstone of our agenda. Remaining calm and staying reasonable allows us to empathize with and understand our opponents as well as our allies. At the heart of this nomination is the desire to see people be more kind and more understanding, even in the face of important political disagreements. If we can abide and elect Calm and Reason as head-of-state-of-mind we may avoid the worst of the damage that politics can do in terms of deepening divisions and stifling the harmony and prosperity of our society. Remaining calm gives us the space to see our political adversaries as co-creators of our nations and our societies, allowing us to more easily find common ground with each other. Being reasonable helps us identify and protect against destructive cognitive biases and grandiose hyperbole. Reason requires us to resort to facts rather than emotion, to consider opposing arguments instead of dismissing them out of hand without trying to make sense of our opponents’ concerns. Though emotion often “feels” right, reason is almost always far more accurate and productive when it comes to determining public policy. Ultimately we all want a society that “raises all boats” and does so with calm and reasonable consideration of the consequences. Please elect Calm and Reason as our leaders for our state-of-mind for this (and every) election season. come on Donald you’re just not all that!! No pipe dream, sarsaparilla fueled sentiment / logic there dude! I’m on the list for stand outs and telephoning on THAT campaign! I hear you man. I’ve had some decent conversations with the most undude fascists and nihilists because I listened. If you’re calm and reasonable they often listen in return–especially if you admit you don’t have all the answers. Heck, I’ve had the same said fascists agreeing with me, at least during our chat. What they do with my words, well… hell, I lost my train of thought. Next Post: What Imperial March?